Reading Herbie Hancock’s memoir is akin to reading the modern history of jazz. His career touched numerous branches of jazz and was responsible for sprouting some entirely new ones. From his mentorship with Donald Byrd, to being a sideman for Miles Davis, to becoming a band leader and trail blazer, reading Herbie’s history gives you a fair reading of the genre itself. The book covers his life story, from his upbringing, discovery of music and performance, and the music he has made with great artists over five decades. 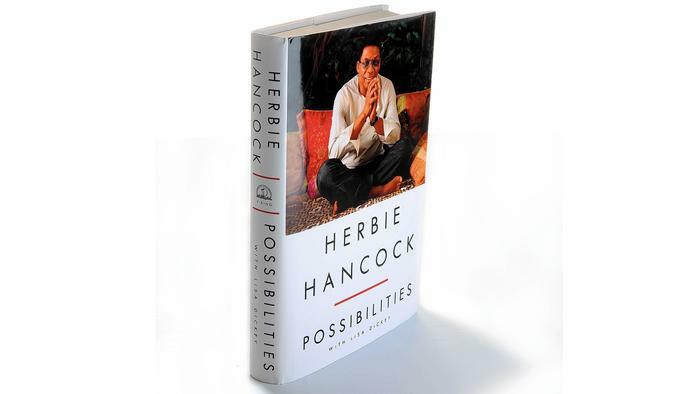 Possibilities is an apt title because the book, and Hancock’s journey, can be characterized with a series of turning points that Hancock had the courage to embrace. It also resonates with his Buddhist philosophy, which receives generous attention in the book. Hancock handles this personal aspect of his story maturely, simply relating how it affected his outlook on life and ultimately his music. Similarly, his confessions and reflections on drug addiction are offered in appropriate contexts, without becoming unseemly. I think the best way to write about this book is to offer a playlist of the recordings that Hancock himself cites throughout the book. Of course, there are too many to offer a comprehensive list. Instead, I’ve filtered my selections for those that I found reflected the most important turning points in developing his remarkable career. 1. Body & Soul, Coleman Hawkins, Body & Soul (Bluebird, 1939) – Hancock’s first professional gig was in 1960 with Coleman Hawkins and this song is recalled in the book as one of the pieces he had to first perform with a professional jazz player. 2. The Injuns, Donald Byrd, Byrd in Hand (Revolver, 1959) – I didn’t know until reading this memoir that Donald Byrd mentored Herbie Hancock as he was coming up in the music business. Byrd took Hancock on as a member of his band and this song was one of the first Herbie played with the band. I was especially intrigued by this connection because Byrd and Hancock happen to be two of my top three favourite musicians of all time. 3. Shangri-La, Donald Byrd, Royal Flush (Blue Note, 1961) – Hancock’s recording debut was on Byrd’s 1961 release, Royal Flush. This was a key event in Hancock’s career because it led to his own recording contract with Blue Note and more importantly, thanks to Byrd’s counsel and urging, culminated in Hancock retaining the publishing rights to his compositions. 4. Watermelon Man, Herbie Hancock, Takin’ Off (Blue Note, 1962) – Hancock’s first record. This would become a major commercial success, paving the way for financial independence thanks to his publishing rights. His income from this record would support more experimental work later in the decade. 5. Burning Spear, Eric Dolphy, Iron Man (Charly Records, 1963) – Playing as a sideman to saxophonist Eric Dolphy was Hancock’s first exposure to free jazz. It was Dolphy’s breaking of the rules of music that helped Hancock see the possibilities in music when new directions were taken. I believe this is one of the most important influences on Hancock’s approach to music, probably second only to Miles Davis himself. 6. Seven Steps to Heaven, Miles Davis, Seven Steps to Heaven (Sony, 1963) – Hancock’s notoriety from Watermelon Man and his reputation as a singular talent lead the great Miles Davis to invite Hancock to join his now legendary quintet. This album was the first of Miles’ records that Hancock appeared on. 7. Maiden Voyage, Herbie Hancock, Maiden Voyage (Blue Note, 1965) – Now a sought after composer, Hancock took on commercial work, writing jingles on the side. A fragment of a jingle for a men’s cologne evolved into this, one of Hancock’s most recognizable compositions. It was unique in its spiralling structure and Hancock discusses his discovery of this form in detail in the book. 8. Blow Up (Main Title), Herbie Hancock, Blow-Up Original Soundtrack (Rhino, 1966) – Hancock’s first commission to do a film soundtrack. It had a sound that was influenced by the pop music of the day. The book contains an amusing story of how Hancock hosted a decoy recording session in Canada to navigate European content rules imposed by the film’s backers. 9. My Ship, Miles Davis, Miles Ahead (Sony, 1957) – Gil Evans’ work on this Miles Davis album strongly influenced Herbie’s first incarnation as a band leader. 10. Speak Like A Child, Herbie Hancock, Speak Like A Child (Blue Note, 1968) – Hancock’s first band was a sextet inspired by the fullness and smoothness of sound on Miles Ahead. He chose 3 horns (Sax, Trombone, and Trumpet). The rhythm section included Miles Davis Quintet bandmate, Ron Carter on Bass. Speak Like a Child was the sextet’s first recording. 11. Stuff, Miles Davis, Miles in the Sky (Sony, 1968) – Another key turning point was Hancock’s discovery of electric instruments. Hancock relates his first encounter with a Fender Rhodes electric piano while in Davis’ quintet. Without a piano to play at a venue they were booked at, Herbie asked his band leader what he was supposed to play. Miles pointed to the Rhodes sitting in the corner of the room and said, “play that.” This track is off the first recording of Miles’ that used the electric piano. 12. Fat Mama, Herbie Hancock, Fat Albert Rotunda (Rhino, 1969) – Having known Bill Cosby for some years before, Hancock was invited by Cosby to write music for TV special, which would later be adapted and become Fat Albert and the Cosby Kids. This was also one of the earlier instances of funk elements in Hancock’s music. 13. Quasar, Herbie Hancock, Crossings (Warner Bros., 1970) – Now in his Mwandishi period, Hancock had embraced Afro-centric culture and was working more in the jazz/funk fusion mileiux with greater degrees of musical experimentation. Hancock himself describes Mwandishi as an “R&D band.” This track off of their Crossings album showcases a new technology Hancock had adopted when he met synthesizer pioneer, Pat Gleeson. The Moog Modular synthesizer first appears in Hancock’s recorded work on this album. 14. Toys, Herbie Hancock, Speak Like a Child (Blue Note, 1968) – Mwandishi’s bassist was Buster Williams and Hancock relates a story in the book where Williams performance of this particular track in 1972 was so focussed that Herbie asked him how he managed to play it so well on that particular day. Williams’ response was that he chanted before the performance in his practice of Buddhism. A philosophy and practice that Hancock adopted from that point forward, Buddhism can’t be overlooked in how it has shaped his personal and professional life. 15. Yes We Can, Can, The Pointer Sisters, The Pointer Sisters (UMG, 1973) – Having spent a few years with Mwandishi in “far out” experimentations, Hancock was searching for a change and was inspired by an unlikely encounter with the Pointer Sisters in 1973. Noting how much of a crowd-pleaser this tune was, Hancock made a sharp turn into funk. 16. Chamaeleon, Herbie Hancock, Head Hunters (Sony, 1973) – Another iconic Hancock composition, Chamaeleon was the first song written and recorded by his next band, The Headhunters. Bernie Maupin was on reeds, Paul Jackson on electric bass, Bill Summers on percussion, Harvey Mason on drums, and Herbie on synthesizers and clavinet. The clavinet allowed Hancock to play guitar lines on the keyboards and meant he didn’t need a guitarist in the band. 17. Doin’ It, Herbie Hancock, Secrets (Columbia, 1976) – His interest in electric instruments continuing to build, Hancock took on a young sound engineer, Brian Bell, for this record. Bell would become an integral part of Hancock’s creative process for years to come. His ingenuity and innovation is showcased heavily in the book. The passage where Bell describes how he managed patch cords in the first synthesizers (that had no memory banks) evokes thoughts of other technology pioneers like Hewlett & Packard or Jobs & Wozniak. 18. Don’t Hold it In, Herbie Hancock, Monster (Sony, 1980) – Now fully invested in making music with computers and electronics, this album was the first in a series where microcomputers, including the Apple II+ and several of Bell’s improvised equipment were featured. Another technological influence was Keith Lofstrom, who developed an automated patch bay for this period in Hancock’s work with early synthesizers. 19. Buffalo Gals, Malcolm McLaren, Duck Rock (Virgin, 1983) – A sea change was hitting popular music in the 1980’s with the emergence of new wave and the post punk British invasion. Hancock first heard this track through some associates who were exposing him to what young people were listening to. The scratching on this record was a direct influence on what would become Hancock’s biggest pop hit of the 80’s. 20. Rockit, Herbie Hancock, Future Shock (Sony, 1983) – Teaming up with producers Bill Laswell and Michael Beinhorn, as well as pioneer turntablist DXT, Hancock released this song accompanied by Godley & Creme music video that hit number 1 on Billboard’s US Dance chart. Rockit also won best R&B Instrumental Performance at the Grammy’s in 1983. 21. Una Noche con Francis, Herbie Hancock, Round Midnight (Original Motion Picture Sountrack) (Sony, 1986) – Returning to more straight-ahead jazz, but still with an innovative spin, Hancock produced the soundtrack to this film, featuring Dexter Gordon in the lead role. He won the Oscar for best soundtrack for this work. 22. Manhattan (Island of Lights and Love), Herbie Hancock, The New Standard (Verve, 1996) – Composed with his sister, Jean Hancock, who had died tragically in a plane crash years before, Hancock included this song on his 1996 release, the The New Standard. Manhattan won the Grammy for Best Instrumental Composition that year. 23. Tony Williams, Herbie Hancock, Future 2 Future (Columbia 2001) – In this current stage of his career, Hancock states in the book that he seeks projects that bring something new to his experience and that have a purpose. This track is a tribute to Tony Williams, the talented drummer and Herbie’s bandmate in Miles’ quintet. Williams’ talent is mentioned at length in the book and this tribute featuring spoken word by Elenni Davis-Knight, is an excellent example of Hancock’s aim to be innovative and purposeful. 24. Both Sides Now, Herbie Hancock, River: The Joni Letters (Verve, 2007) – A truly great talent never wanes and Hancock was on top again with this album, a deliberate tribute to an artist he respects greatly, Joni Mitchell. This record won Album of the Year at the 2007 Grammy Awards. Although I’ve tried to distill what resonated most with me, I would recommend a full reading of Possibilities to personalize your own appreciation of Hancock’s life and career. Like the genre he helped shape, this book offers so much insight that each reader will develop a slightly different view of Hancock’s life and music. In this, Hancock and his writing partner Lisa Dickey have achieved what Hancock has done time and time again in his career: create something that adds to our experience of music but do so in a way that is not uniform among those who listen.